Hong Kong’s Ten Thousand Buddhas Monastery, also known as Man Fat Tsz, is in Pai Tau Village at Sha Tin. Directions and Photos of Ten Thousand Buddhas. 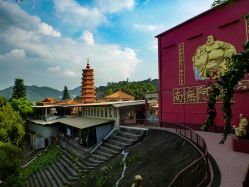 Hong Kong’s Ten Thousand Buddhas Monastery, also known as Man Fat Tsz, is in Pai Tau Village at Sha Tin. Pai Tau Village is more of a temple than a monastery because there are no resident monks. Instead, like most temples in Hong Kong, it’s managed by temple people, not to be confused with the Village People. It’s definitely a tourist attraction but worth checking out for the spectacle and unmatched density of gold colored statues that populate the monastery grounds everywhere you look. Once you get close to the monastery you’ll find a long but friendly set of stairs that brings to you the main temple pavilion. The stairs are lined with hundreds of life sized gold buddha statues along the way. In fact, all of the gold statues you see below are at least life sized, and most of them quite a bit larger. The main pavilion is a well used temple area with dozens of statues, some quite large, and a handful of temples. There are restrooms, a place to eat, and a small gift shop where you can buy all manner of temple beads, baubles, pendants, bracelets, Chinese Zodiac charms and other wares. At one end of the pavilion there is a path leading up the hill that takes you to another section of temples and countless more more gold buddhas and other statues. I even found an outdoor bonsai tree garden guarded by the Chinese version of garden gnomes, also gold. The second level feels more relaxed than the main pavilion. This is probably due to the fact that most people visiting the main pavilion don’t seem all that enthused about walking up any more stairs or perhaps because of the undeniable presence of a thick layer of magical chill out buddha energy. Either way, it has that same peaceful easy feeling you get driving a VW Bus west through the Utah desert an hour before sundown and a mile from your camp site. At the end of the second temple level are more stairs that lead to an area where a huge lounging buddha carved into stone is happily eating grapes (or are those prayer beads?) while enjoying the babbling brook and his legion of gold forest warrior guardians who await eternally for the inevitable garden gnome attack. Basically it’s a standard meditation area with a lot of seeds for the imaginative and about as far as you can get from the tourists at the main pavilion, and, definitely worth checking out.